You are looking at the beautiful Vietnam War Memorial Park. It is located under the Midpoint Memorial Bridge connecting Cape Coral and Fort Myers in Florida. On the Cape Coral side of the bridge, there is a replica of the statue from the Marine Corps War Memorial in Rosslyn, Virginia (which is just outside of Washington, D.C.). The statue depicts the six U.S Marines raising the American flag at the Battle of Iwo Jima. On the Fort Myers side, there is a small Vietnam War Memorial tucked right under the bridge and spanning north from there. If you looking for a little escape for a few minutes, this is the place. Hardly anybody knows about this little hidden gem, including myself until my hubster pointed it out to me one day. 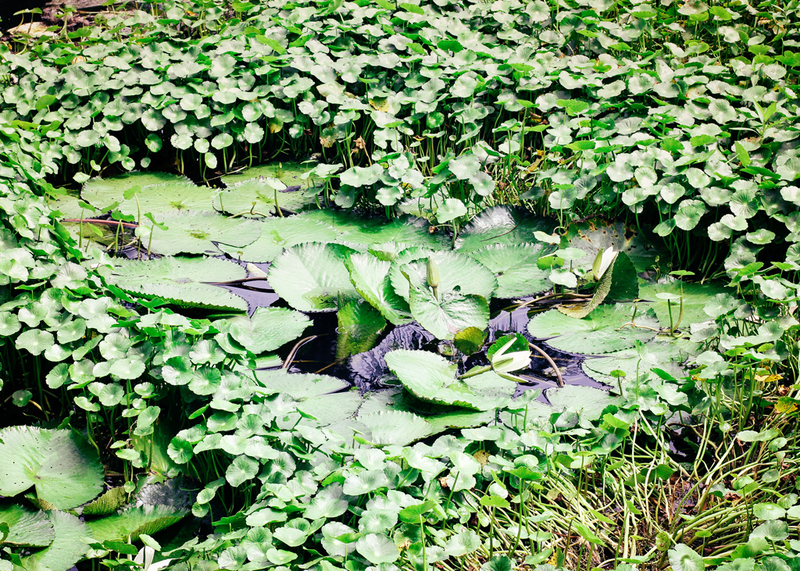 It was such a delight to see all the lily pads in the pond. This girl LOVES her lily pads…aaah! DO they give you delight? We have talked about the Get Down Low Perspective when taking photos in the past. Today, I want to give you a few examples of the Framing Perspective. In the fourth photo, this is one of many ways to frame your image. I used nature for the frame.You can see where the smaller pads are framing the larger ones in a circle. The magic…it draws the eye to the subject and gives compositional interest. Let your imagination run wild looking for how to frame your subject. This isn’t just for professionals…you can do this for fun with your iPhone!!! The possibilities are limitless!!! The next time you have your iPhone out…see where you can shoot a FRAMED photo. If this is your first or second time visiting here, we would love for you to join our growing family here at Pride in Photos. Go down below and fill in your email and you will start receiving the inspirational tips right in your inbox. Really cool duck. It looks like there is another eye on his beak. I know it’s probably the coloring, but interesting nonetheless. Thanks for all your visits and the likes of all my posts ending with this last one “Bouquet of Buds”. Gorgeous! My fave is the last one of the lily pads. Reminds me of a Monet painting! Glorious is right! I want to see your lovely images in person some day. Absolutely gorgeous views of the memorial. Love the greens! I’m loving all the greens and that fourth shot, especially. Glorious is the perfect word for these photos! The green colors are rich. Lovely! Did not know there was a Vietnam War park in Florida. VERY pretty. You are so fortunate to have such beautiful ponds filled with lily pads. Nice framing. Great tips and great shots! Such scenic, rich greens in these delightful photos! Especially love the melting of colours in the water in the last photo! 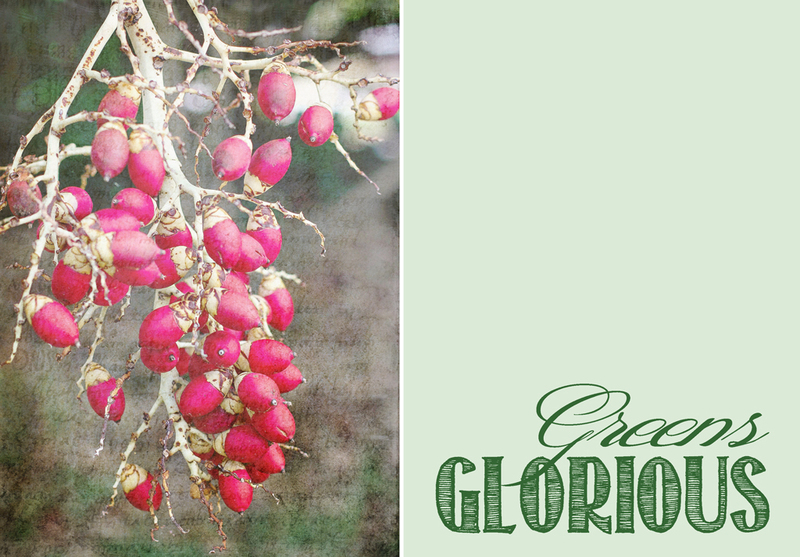 Your ‘glorious greens’ just pop off the screen! Beautiful. 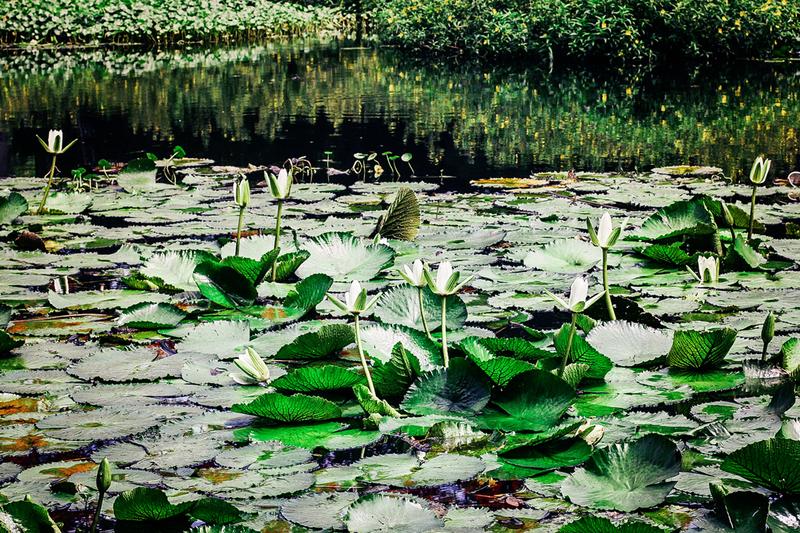 These are all wonderful shots…and those lily pads are huge! Love the duck! I’m a huge duck fan. Well pretty much all nature. Ahh, green glorious green…great shots. And thanks again for all your wonderful tips for us bloggers. Always nteresting info!! Of course the duck is my favorite! But these are all so wonderful Laurie. Thanks for the photo tips on framing too. Very useful. I especially love the duck. 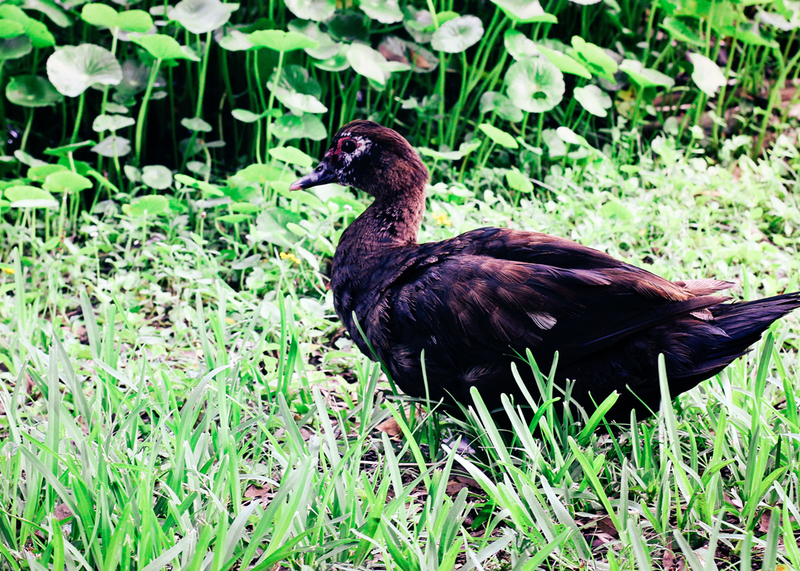 What a beautiful brown those feathers are! Can’t help but smile at all that green! Lovely, Laurie! Glorious is right! Your photos are beautiful! Wonderful shots, I especially like the textures you applied on them. I am not active on WordPress, thanks for visiting my blogger. Oh, those lily pads are gorgeous! Almost looks like Monets garden, very pretty. There seems like so much to see and do in that area. Hope we can return. i love the texture on the first photo – wow! so gorgeous! I love your effect on the lily pads…they are very intriguing, indeed. Have a wonderful week! Blessings to you! Look at those wonderful colors!! These are fantastic, all of ’em! I always enjoy your photos.. And I also enjoy your photo tips..
Never knew this park was there! Thanks for sharing these great photos! Simply beautiful! Do you know what those red things are? They are very interesting! Terrific photos of a unique location. Wonderful images Laurie. I love those lily pads. That park looks really lovely, peaceful and relaxing! I have to say I really appreciate your photography tips! Wow..I want to be there, great pictures. So green and so beautiful! Thank you for the tips. Beautiful greens indeed, great work! I agree with Kim, the last image does indeed look like the famous Monet painting. Beautiful photos! I love lily pads, too as long as they are snake free! So pretty. The last one looks like a real life Monet! Love it! I love lily pads too! Looks like a wonderful little park to visit. How green and lush! Wow! What an incredible spot! How do you manage to capture all the wildlife shots, you must be very stealthy! the lily pads are amazing, and the last photo is indeed an art piece. Gorgeous! I love the natural framing and I love the depth of your shots! Hello! Great photos. Have a good week! These are gorgeous photos and I sincerely appreciate your tips. Beautiful photos as always. I love the lily pads. Oh! Yeah! I see it. The frame looks like a heart. Thank you so much for sharing your tips. I really love them. and I LOVE your photos! Wow! they are wonderful. Have a great Monday!